The famous Madurai city, in the South, possesses its unique and exclusive food like Paruthi paal, jigarthanda, panangkarkandu paal. 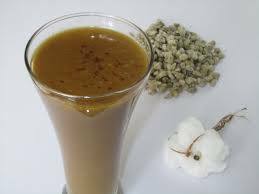 Paruthi pal is yet another drink made of cotton seeds, flour of raw rice, coconut and jaggery. This drink is available only in a very few cities in the State, and Madurai is one among them. As for the health aspect, it is good for those who suffer with problems like cold and cough. This drink also helps reducing heart diseases, and can be taken by diabetes patients too. Available at a low cost this drink can be enjoyed by all. Extract milk from cotton seeds by adding a little water to it and grinding in the mixer. Strain the milk from it using a muslin cloth. Similarly extract milk from the coconut milk same as in the above step. In vessel tip in the cotton seed milk extract and add the rice flour. While stirring bring to boil. Now tip in the coconut milk and boil again for 5 minutes. Reduce flame and add the jaggery, dry ginger and cardamom. Stir continuously during process. Stir on low flame for another 10 minutes or so till the ‘paal’ becomes a little thick and a strong flavour begins to emanate.